This weekend we had a day of rain, so I prepped some Christmas pieces, something new and something to finish, so I will have a couple of things to show this Friday. Since we got out for a nice ride on Sunday, I thought I would show you a bit of foliage and the Connecticut sights. 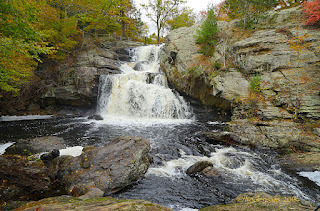 We stopped at the Yantic River to see the falls. I had a feeling that they would be running higher with the rains and we were not disappointed. 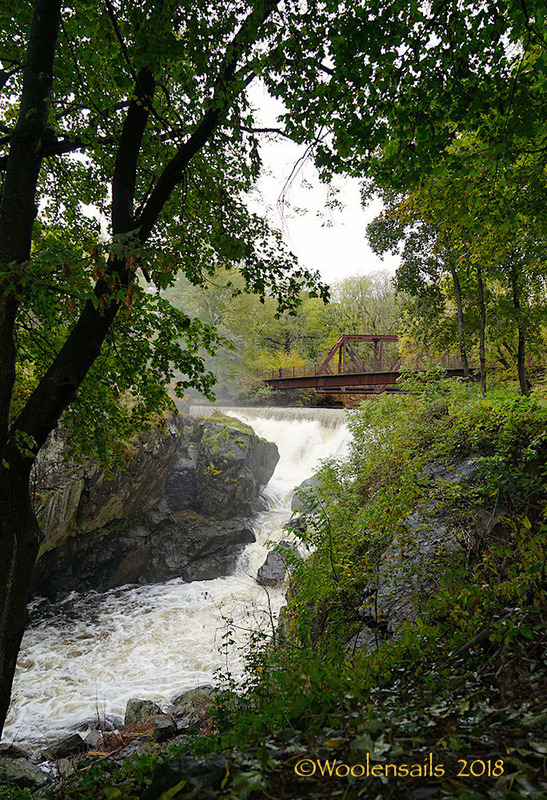 Up river, another falls goes past the old mill. We headed down route 82, and stopped at the primitive store that I had seen online. It was a wonderful shop, filled with antiques and unique items, as well as prims. I will definitely stop by, more often, when we are in the area. The name is Primitive Crow, and they also hold primitive painting classes, wish I lived closer. And when you go down the back roads, you find fun things. Love how they used the truck for a yard display, even painting their name on the side. We made our way to Devil's Hopyard. 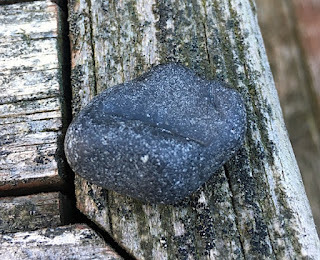 Connecticut is famous for weird names, they believed that the big indents in the rocks were made by the devil's hoofs. But the name doesn't fit the beauty of the area. The falls were overflowing from the rains and you could just sit there and watch them cascade down the steps. 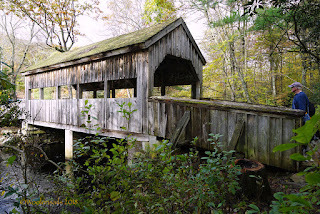 We walked along the paths and of course had to stop by the covered bridge. Watching all the people come down and head up the path, tempted me to try a hike up to the over look. Tempted but not attempted too well, lol. Getting up the first wet and slippery incline was bad enough, but when we got the a small crossing, the waters were higher and I was in no mood to try and jump over the water or slip on the rocks, so we turned around. 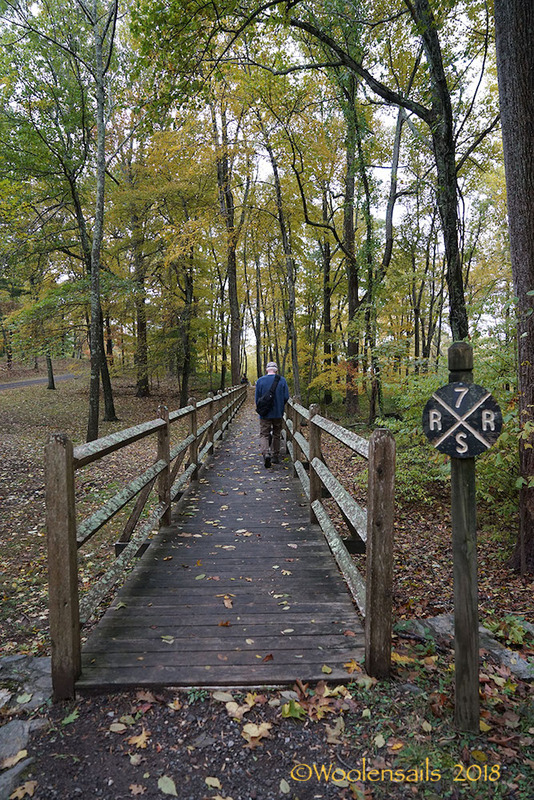 I decided to head towards the lower path and avoid slipping down the incline, which was easier and a nicer walk along the river. Our last destination was Gillette Castle. I really wanted to walk there, but we were running late from the first hike, so we just walked around the main area. The views were spectacular, pops of color dotted the landscape. 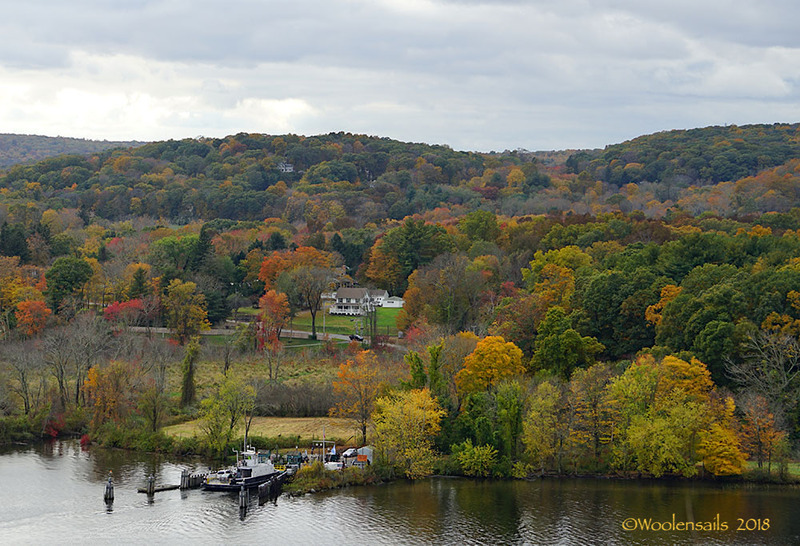 All along our drive and the areas, were beautiful displays of foliage, but most of the wooded areas are full of trees that only turn yellow. And of course, any time I saw a beautiful tree, it was in a place I couldn't stop at or go into. It was a beautiful day though and something you just have to do, to enjoy. 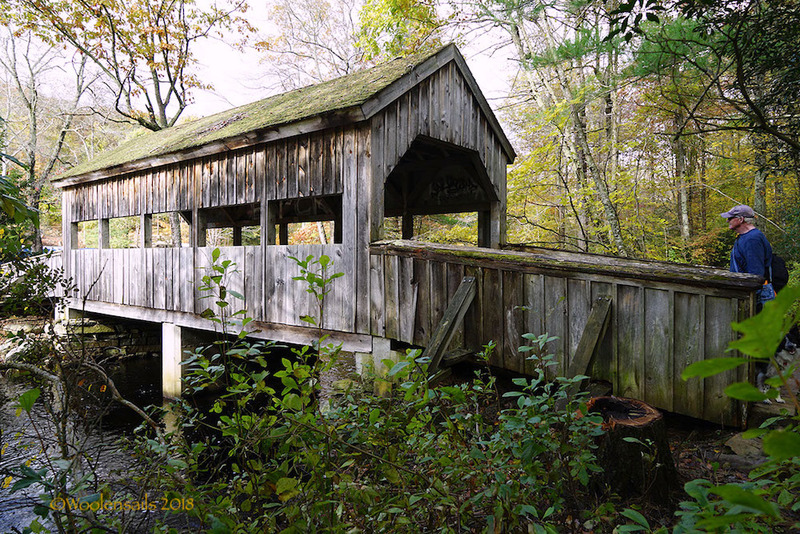 Connecticut is full of country roads and scenic routes, well worth a visit. Of course Bean loved going too, he got to go on lots of walks and meet hundreds of people, another reason we didn't have as much time. One guy actually came over and started hugging Bean, lol. He had a Border once and Bean is just so lovable, everyone wants to pet and hug him. 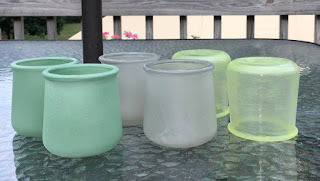 This week I practiced on some glass jars and tried some new mediums. I previously used spray on, sea glass paint, but that only works if it is nice out and no wind. 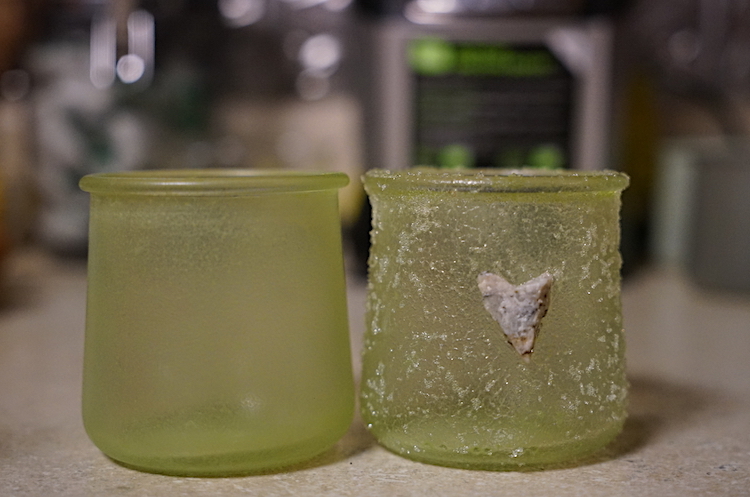 So, I tried another product by Ceramcoat, frosted glass paint. I was able to get some at our local Michaels, but it is hard to find different colors in the store, so I ordered more this week from Create for Less. I had a green, called sea grass and was able to find Jade, which is more like a blue. In the photo, the ones on the left and right were done with the glass paint, mixed with antique decoupage. The ones in the middle are done with just the glass paint. It is hard to see in the photo, but I found that the straight paint works best, with decoupage, the glass chipped off when I was working on it. You can also bake them, after you let the paint set and that makes them washable, so I will have to try that next. Here are the results of the paint and the colors. I also tried another product from Golden, called glass gel bead. It makes a nice sparkle on the glass, which looks pretty with a candle or lights in the room. 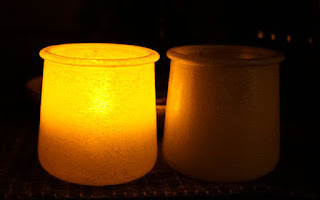 I have been using flicker lights for now, later I will try a candle, outside, to make sure it doesn't cause fumes or explode, lol. I loved the thicker blue shade and thought it was the perfect background for painting on. I used a design from one of my books for the ship and the lighthouse came from a free pattern at Artist's Club. My sister is already trying to buy them from me, but she also is having a light weight flute made by a tribe member in her area, so I will make her a box of goodies in exchange. I also wanted to try some simple ornaments. I was able to find the wood pieces at Michaels, I like the white tag the best, it is a nice size to work with and already painted. The angel on blue was another experiment with the glass bead gel. It shines when you move it around, so I think that will be nice to add to ornaments with the tree lights, shining on them. I used a new glue too, tacky clear gel. 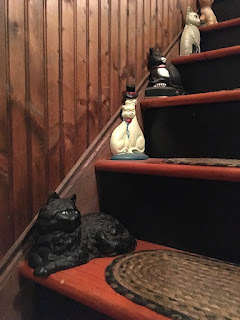 It is not as thick as the regular tacky, so it took some patience to place things and keep them from moving, and on the brick, it does show where I moved the arm. 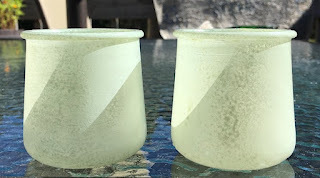 I am also wondering how the glass gel will look on items like the white pottery dress, another thing to try. We went out for some rides this weekend, but the foliage was being elusive. 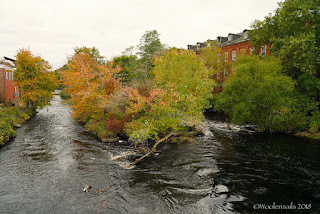 It seemed some areas had nice spots of color, while others were still green. Tomorrow is going to be stormy, so hopefully their will still be some foliage left on Sunday. This is in Rhode Island, outside the village of Westerly. 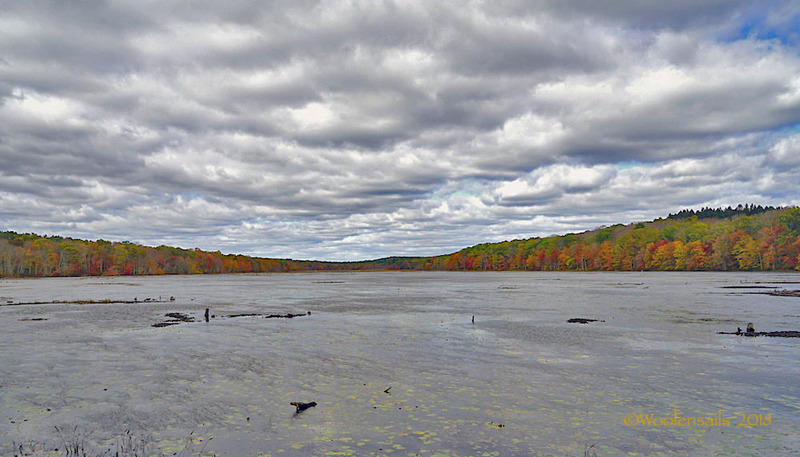 In Connecticut, we saw some foliage at Goodwin Forest. 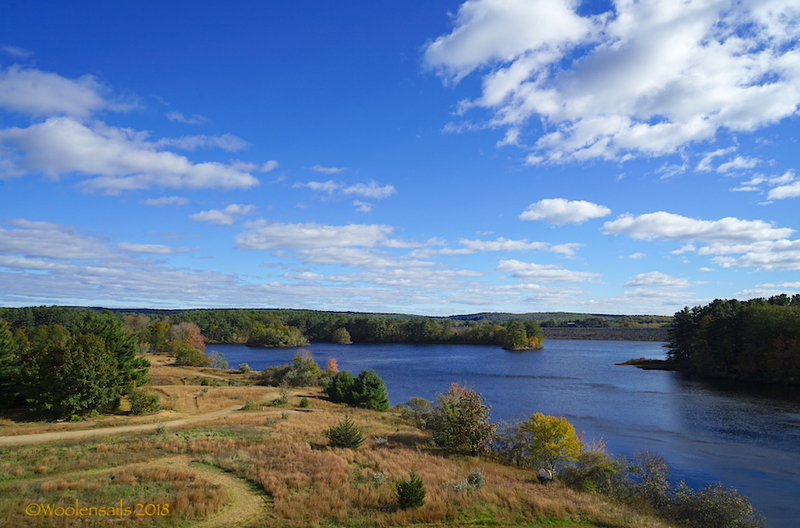 And we ended the day with a visit to Mansfield Hollow, with a view from the top of the dam. I hope you all have a wonderful weekend, filled with your own adventures and experiments. This week I enjoyed some rest time and worked on some little pillows. The pattern is by Cheri Payne and in her older Christmas book and also available as a download on Quilts By Cheri, on Facebook. It was a fun project to do and worked up quickly. I did one in a simple prim style and the other with some brighter bells and buttons. I did add a bit of walnut stain to tone down the lighter colors. We also got a chance to shop last weekend. 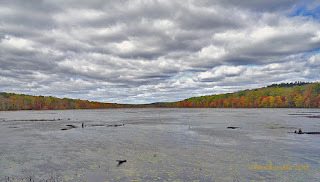 We took a ride to the upper area of Connecticut to see if we could find any foliage. No real foliage but some great shops to stop at. 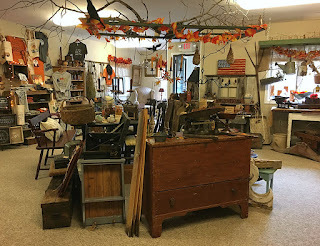 One is a Christmas shop, they have lots of different items, along with antiques. I got some grubby candles and I found this wonderful bottle. It is an old, Cod liver oil, bottle, with a fishermen carrying a cod. Perfect for my beach room. There was no price on it, so the lady sold it to me for 4.50, great deal. 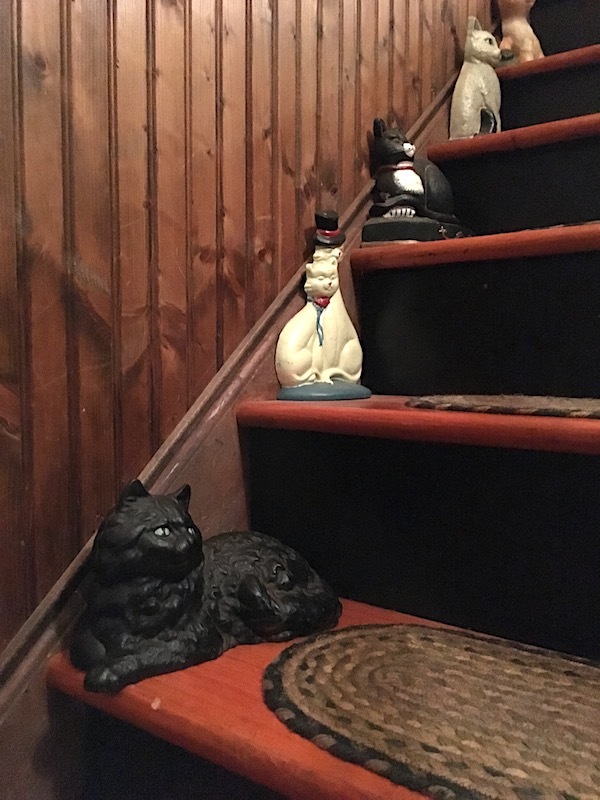 I decided to stop at a local shop, that I haven't been to in awhile and found a new black cat door stop, for my collection. I am always on the lookout and only ones that I like and for good prices, so it won't be a big collection, but fun to look for and I still have one more step to fill. I am still working on glass ideas and an angel ornament. The weather has been cool and windy, not good weather for outdoor spraying, so I may have to buy a cheap tent to use outside, to do work like that. 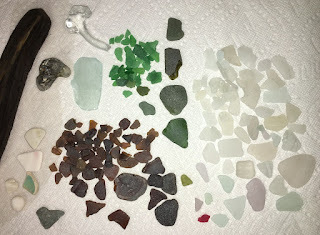 We did get some beach time in and we didn't find a lot of glass, since it was later in the day. Sometimes I find something that seems different but doesn't look like glass. This is what I found and I decided to keep it and check it at home. And this is what it looks like, when you concentrate the light under it. The light makes it more yellow, but it is a green piece of glass. You would never know when you see something like this on the beach, so always worth carrying a light with you. The thicker, dark pieces don't always show the light through them, unless it is concentrated. I hope you all have a wonderful weekend. 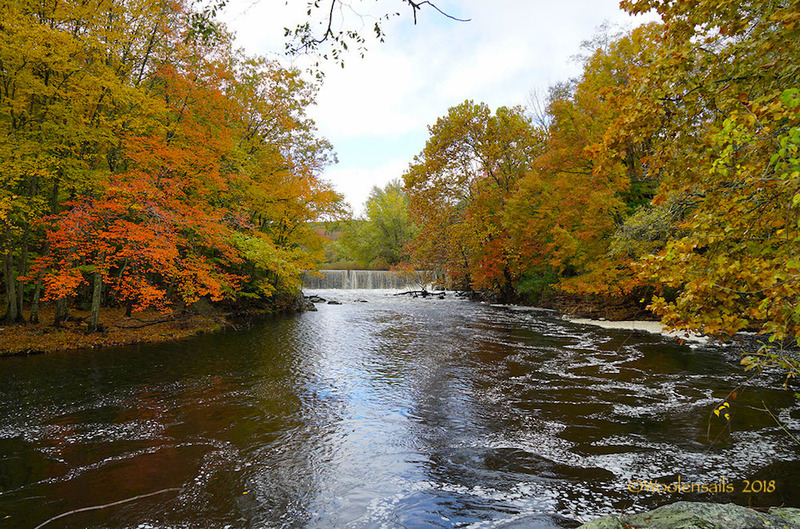 We are going to try and find some foliage this weekend. 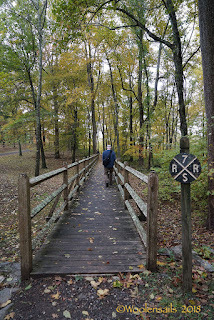 We will head into Connecticut, or maybe Massachusetts, but I am happy if we just get out and get some hiking in. I think I need to do more activity that doesn't include constant bending. This week seems to have gone by too quick. I had lots of things I wanted to do, while Bill had the week off, but most of the week, I was happy to have a few hours out and rest at home. I really wish we could have gone to New Hampshire to see the foliage, but we were able to enjoy some nice days at the beach and our foliage is still coming, so a few more weekends to enjoy the colors. I was able to do another stitchery. 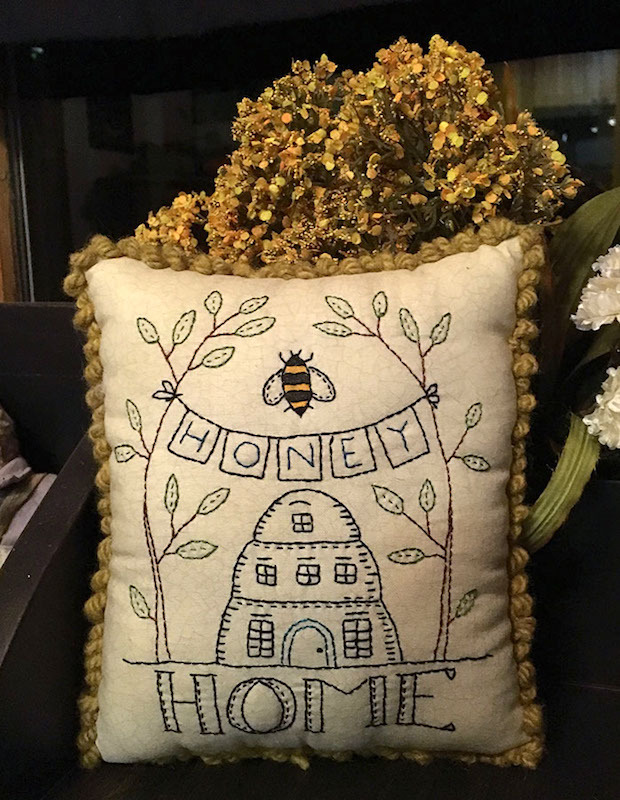 My niece loved the bee pillow, but I know she is not into prim, so I made one with more color and crackle fabric. 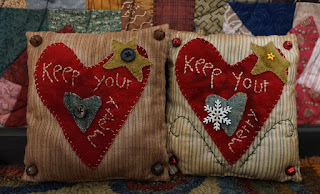 The design and crackle fabric is from Kathy Schmitz. 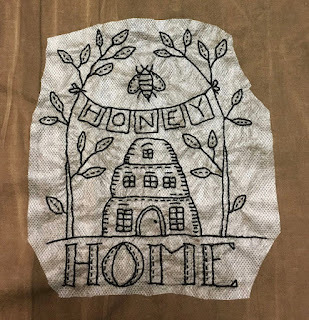 I prefer to stitch without something in the way, and I think my stitches look better on this one. And of course we got lots of beach time in and lots of hunting for sea treasures. 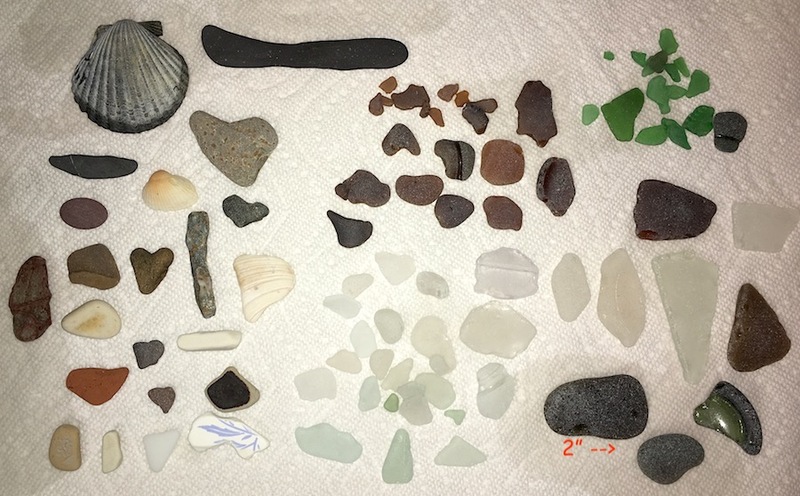 On Saturday we found some nice pieces at the ocean. 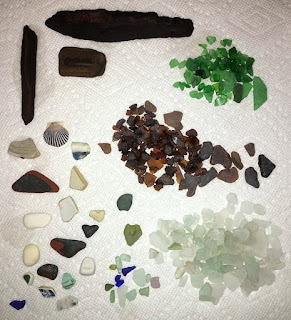 On Monday we hit my favorite beach without the crowds and found some nice pieces, along with some pottery pieces. Tuesday was an unusually warm day, so back to the ocean. We got lots of smalls, which will be fun to use in Christmas ornaments, that I have some ideas for. Wednesday it was back to my favorite beach and we hit it, at the right time. We found a lot of nice pieces and even with a few people on the beach, I found ones they missed. I think I have enough to do a few projects. We also went shopping and I got some new glass paints and sprays to try. 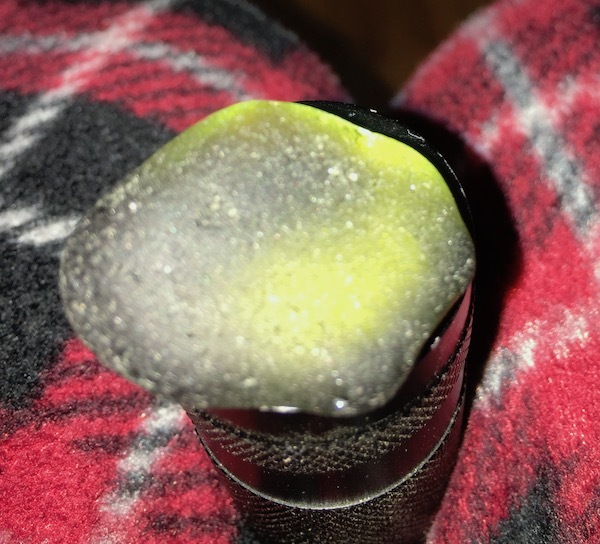 I did a few and some didn't work right and some I like, so I will do a post with a review on the different mediums I have used and what works best, with some how to's. Here is a photo of my first tries. The light green was a mess, so I washed that off and did a nicer job on the second try. 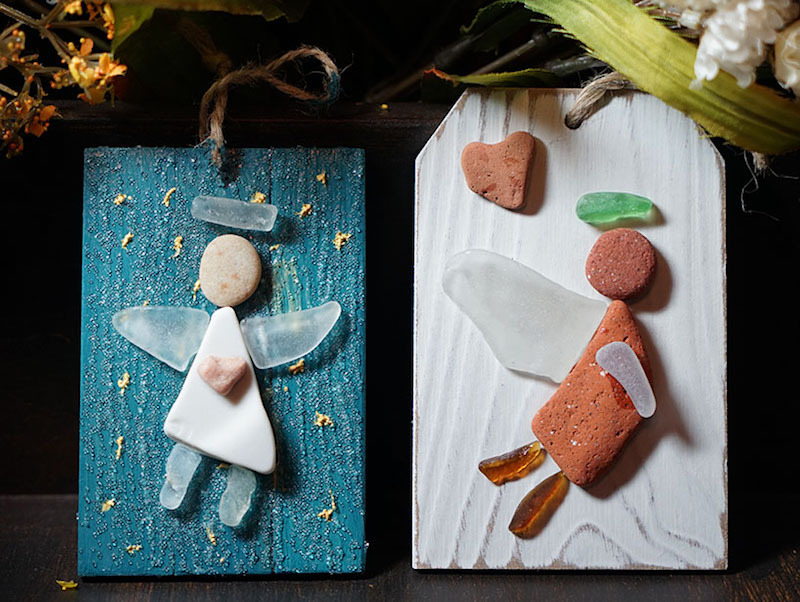 The others are spray on sea glass paint. Never spray on a windy day, it came out too thick, so I will retry on a nicer day. It has been a long few weeks, but my sister left this week and I can finally relax and hopefully get better. My visit to the doctor revealed congestion that is causing me to feel wheezy and out of breath, so he has me back on medicine. I have been resting and getting a few things done, but just having time to myself, has helped and time to create again. I think as artists, we need to create, it is what keeps us happy and healthy. Bill has the week off and I am still undecided on what to do. Go to NH and hope the foliage blooms this week, or stay home and enjoy our area while the weather is good. I know we will have a pretty good week, not so sure what the weather will be in NH. I guess I better make up my mind tomorrow if I want to make reservations. One thing I got to do this week, was make a new stitchery. The design is by Kathy Schmitz for her one stitch club. I admit, I was hoping for a halloween piece, but this was a fun one to do. It seems to be popular, since my nieces love it, and I am making them one with a lighter background and more color. 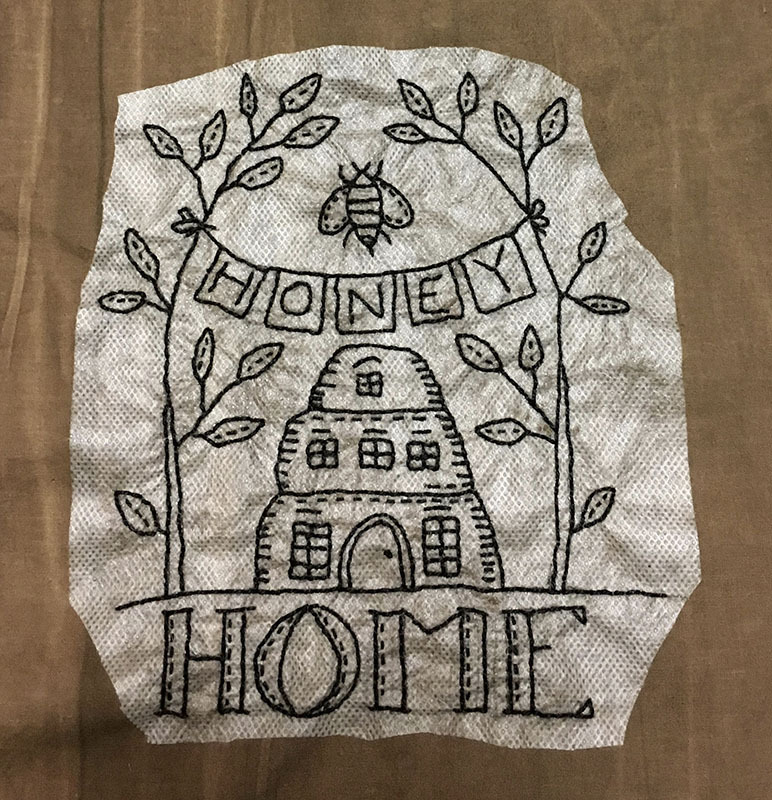 This piece I made using my coffee stained muslin. I love the dark color, but you cannot trace on it, with the light pad. So, I got a piece of my Sulky Solvy and traced it on that. It is easy to trace on and you can use it in a printer if you want. It sticks well, and be repositioned if it is not centered. It does stay on while you are stitching, which is another plus. Here is how it looked after I stitched it. The bad thing is, it is harder to stitch through. The gummy back also gets on your needle, so harder on your hands and joints, to push the needle through. And here it is, after I washed it off and made it into a pillow. I was not happy with the results, I see quite a few gaps. 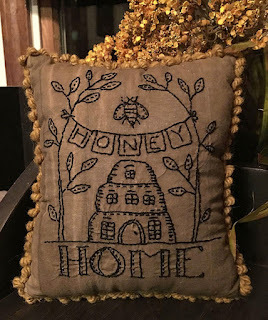 Not That I don't have some when I stitch, but areas that looked stitched on the paper, were actually empty. It washes off easily, but it did leave some residue, so I had to rinse it longer than they said and more than once. I can still see a bit, that didn't come off. Someone did mention that washing the fabric first, makes it wash off easier, so I guess I will have to try that. Another project I worked on was, painting glass jars. Bill has been getting yogurt in jars and they look just like candle holders. 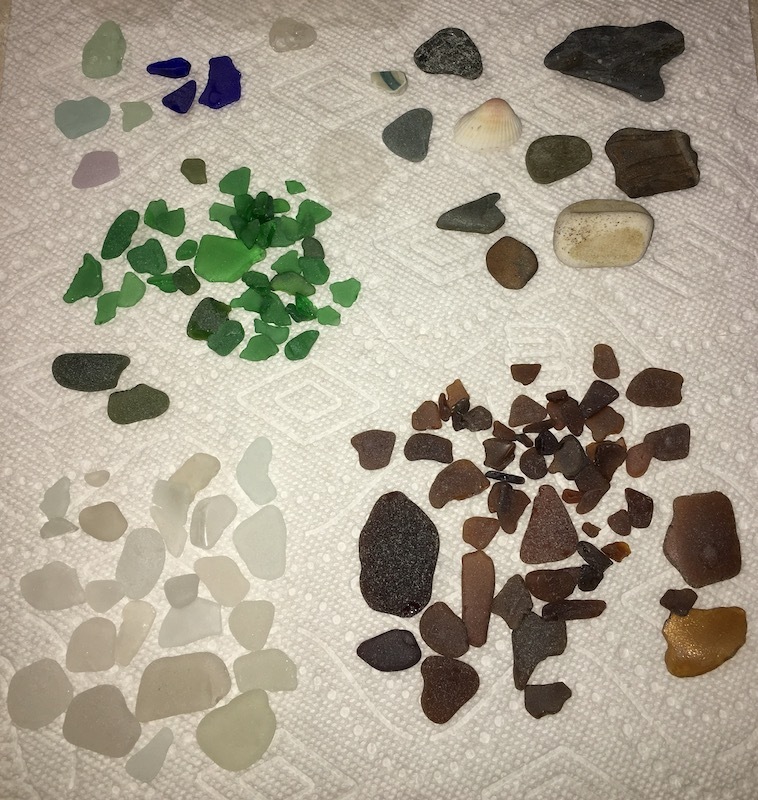 I didn't have time to shop for sea glass paints, so I tried my own. I mixed sea foam green with antique decoupage. Painting it on, left streaks, with brush and a sponge brush, wasn't happy with the results. Then I remembered I had a small sponge and tried that. I like the look of sponging and it has more of a beach look. After the paint dried, I added a light coat of gloss to seal it. 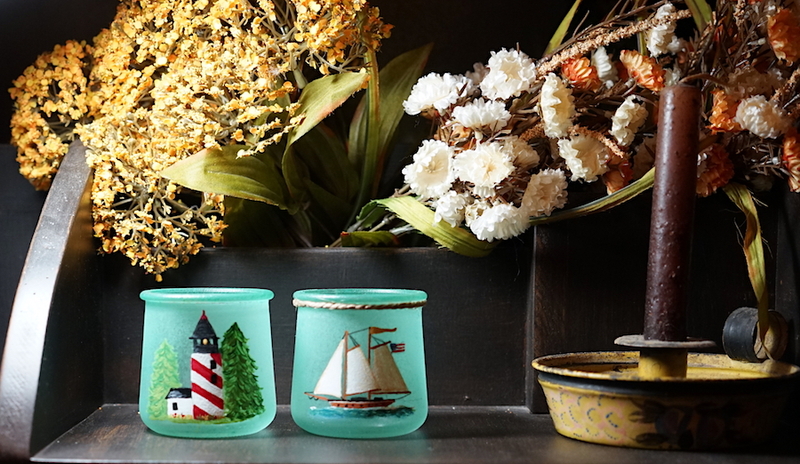 I was thinking I could do little sailboats with glass or I may try painting a design on this set. And if they have a candle in them, the design or glass would light up. This is with a tea candle, but I did not paint the insides, so you can burn a candle in them. Hopefully this weekend, I can find some frost paint and I also read that enamel is good, as well. It is a great way to reuse the jars and something anyone can do. You could also decoupage paper designs from your computer or ones that are found at the craft store. I hope you all have a wonderful holiday weekend.